In an attempt to update our membership database, we are reviewing our membership files to make sure we have the most current contact information for our active members. 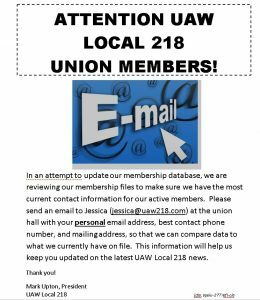 Please send an email to Jessica (jessica@uaw218.com) at the union hall with your personal email address, best contact phone number, and mailing address, so that we can compare data to what we currently have on file. This information will help us keep you updated on the latest UAW Local 218 news.